Softros LAN Messenger allows you to send preset messages with a keyboard shortcut or just a couple of clicks. On the toolbar found between the Conversation and Message text boxes, click the Quick Messages button, and then click Configure. 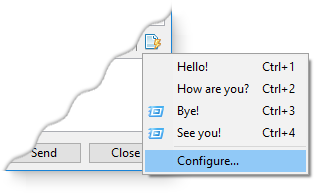 In the Quick Messages dialog box, add or edit a message by entering it in one of the Quick message text boxes. You can configure up to 10 messages. To add a keyboard shortcut (CTRL+), type it in the Hot key box next to the message. The Auto send check box allows you to have the message sent immediately after you click it in the Quick Messages menu or after you press the keyboard shortcut associated with it. On the toolbar found between the Conversation and Message text boxes, click the Quick Messages button, and then click a preset message you need. Depending on your settings, the message will either be inserted into the Message text box, or sent automatically right away. If a keyboard shortcut has been assigned for this preset message, you can just press it on the keyboard instead of opening the Quick Messages menu.